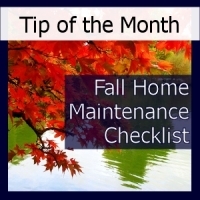 Now that we are in the fall season, it is very important to do a maintenance checklist around your home. Taking corrective action as soon as possible can save you thousands of dollars and prevent any further damages. 1. It is a good idea to clean and service your heating system. 2. Clean leaves, nests and other obstructions from your eavestroughs, roof and chimney, and test the downspouts to ensure there is adequate drainage away from your home. 3. Make sure the ground around your home slopes away from the foundation. This will help keep water and melting snow away from your house, and out of your basement. 4. Make sure all your windows and skylights close tightly, and test your plumbing shut-off valves to be sure they're working properly.